So you want to hide a spare key for emergencies? But where are the best places to hide a key outside your house? Where NOT to Hide a Spare Key!! Don’t use a magnetic hidden key box under your car– burglars are too observant and inquisitive. Don’t use a key safe for outside the house – unless you are only keeping one key in it and there is another key for security. These are really only suitable for elderly people with carers who need to access the property or for holiday makers arriving at short let holiday properties. 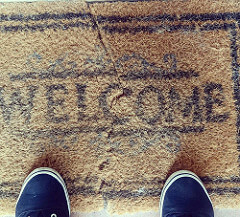 Absolutely don’t ever leave a spare key under your door mat – it’s just not worth the risk. There are some interesting and unusual ideas on Pinterest, but what if the burglars are also reading these tips and you never know when you are being watched! If a burglar finds a hidden key to access your property, not only will you be a victim of burglary but your insurance company will refuse to pay out. Leaving a key with a trusted neighbour is the best and safest option. If leaving a spare key with a neighbour isn’t an option and you really want some kind of outdoor key hider, a good key safe is probably the safest option, but as I said it isn’t the best option and not one that I would encourage customers to use for a full set of door keys. IKS Locksmiths in London are MLA Approved Locksmiths covering North London and Hertfordshire as well as Central London. If you find yourself getting locked out regularly you may want to read our post I’m Locked Out Again! for some top tips on how to break the cycle of getting locked out. For lots of money saving security tips why not join us on twitter. If you do find yourself locked out we would be happy to help. Don’t hesitate to call us in an emergency. Why not save our number just in case of an unforeseen emergency 07947426981. We would be happy to answer any questions you may have regarding security.